Today at GTC Japan, we introduced a family of systems for autonomous machines: NVIDIA AGX. This includes DRIVE AGX for self-driving cars, Jetson AGX for robotics and smart cities and Clara AGX for healthcare. The latest AGX system, Jetson AGX Xavier, is now available for developers to order. This enables them to get a jumpstart on creating the next-generation of robots, drones and other autonomous machines. Jetson AGX Xavier has been selected by Japan’s leading industrial and manufacturing companies: FANUC, Komatsu, Musashi Seimitsu, Kawada Technologies. Yamaha has also adopted this development system to power its upcoming lineup of autonomous machines for land, air, and sea. 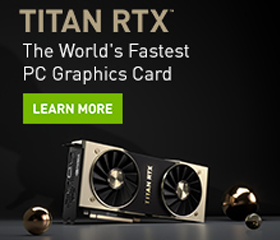 Jetson AGX Xavier is capable of delivering up to 32 TeraOPS (TOPS) of compute performance* from a 512-core integrated Volta Tensor Core GPU, and dual Deep Learning Accelerator (DLA) engines. 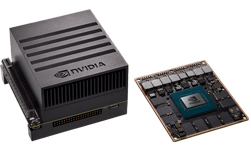 Jetson AGX Xavier provides performance similar to a GPU workstation in a deployable, energy-efficient module ideal for bringing resource-intensive autonomous capabilities to intelligent platforms. It delivers maximum compute at the edge for an entirely new class of robots and other autonomous machines for manufacturing, retail, healthcare and more. With user-configurable operating modes between 10W, 15W, and 30W, Jetson AGX Xavier has greater than 10X the energy efficiency and more than 20X the performance of its predecessor, Jetson TX2. Jetson AGX Xavier’s 16GB of 256-bit LPDDR4x memory provides 137GB/s of bandwidth, ideal for AI-powered vision and multimedia applications processing high-bandwidth sensors like HD cameras and LIDARs with low latency. It can encode up to four 4Kp60 streams and decode two 8Kp30 with hardware video codecs. High-bandwidth I/O includes 16x MIPI CSI-2 lanes to connect six sensors directly or up to 36 virtual channels, 8x SLVS-EC lanes, and five PCIe Gen 4 controllers (1×8, 1×4, 1×2, 2×1) with support for root complex and endpoint modes. The Jetson AGX Xavier embedded compute module measures 100x87mm and utilizes a high density 699-pin board-to-board connector for breaking out the I/O signals to carrier boards and user-defined systems. The Jetson AGX Xavier Developer Kit is now available for $2,499 (USD). Members of the NVIDIA Developer Program are eligible to order their first kit at a special price of $1,299 (USD). Prices vary by region or distributor, and taxes/duties may apply.